The Camp (a.k.a. "Camp Mishemokwa) is located deep in the Appalachian mountains in Hendersonville, NC and the views are freaking spectacular! Tamsin and I bonded early and fast over England - she is from there and I lived there when I went to Oxford). She is one of the kindest human beings I've ever met. Anyone who is a foster mom for an extended period of time just digs themselves into my soul. With her family coming over from England and Tyler's family coming from all over the United States, they wanted to choose a destination location that would foster relationship building so why not a summer camp? The Camp used to be just that and now it is a wedding venue with massive fully decked out luxury homes for the guests to stay in. The bunks are all still there though as is the fully functioning water slide. Oh yes - a water slide that you KNOW we used as the exit! 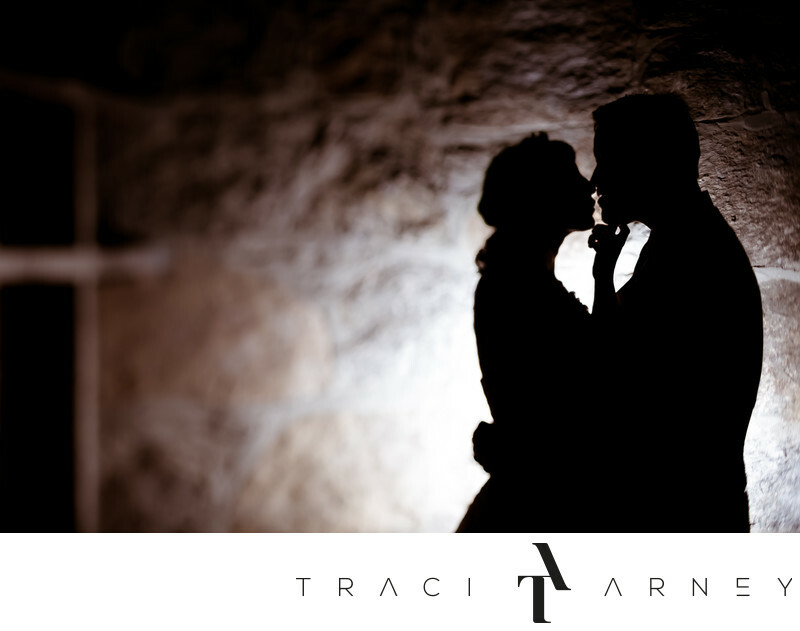 For their Romance Session, one of the locations we used was the old stone bunk rooms. I love the textures that the backlighting gave us. I shot this image with my sweet tilt-shift "Tildy" which made the cubbies on the left of the image go out of focus while leaving Tamsin and Tyler in sharp focused silhouette. Keywords: Asheville (102), Backlighting (27), Camp Mishemokwa (6), Destination Wedding (186), Hendersonville (12), Mountain Wedding (3), NC (636), Outdoor Wedding (30), Romance Session (87), Silhouette (57), The Camp (12), Tilt-Shift (18). 1/200; f/2.8; ISO 640; 90.0 mm.